Loni Richards has been an artist all her life. Prior to becoming a glass artist, she took several college-level drawing courses. She began creating glass art when she took an Introduction to Mosaics course in Vienna, Virginia and has not stopped since. She immediately fell in love with glass as a medium and started taking other mosaic courses to further her understanding of the medium, including pet portraiture and outdoor mosaics. Even today she continues to participate in mosaic classes to improve her technique and learn new methods. However, when she took a glass fusion class in the fall of 2013, she found a new love. Now she incorporates glass fusions in her mosaics and mosaic technique in her fused glass art. She belongs to the professional mosaic group Contemporary Mosaic Art, which provides an online forum for mosaic artists to share their work and ideas. Loni has taken glass casting courses, which opened her art up to 3-dimensional creations. Through her glass art creations Loni has learned to let go of control and be free and accepting of the imperfections and variations that make our world exciting. She hopes that her work with glass will encourage others to pursue their dreams, to be loving and accepting of others, and to see beauty in every aspect of life. “I have always maintained that each person has something to contribute in life. None of us is perfect but together we make the world a more beautiful place to live. Likewise each piece of a mosaic is critical to the overall beauty of the piece,” says Richards. 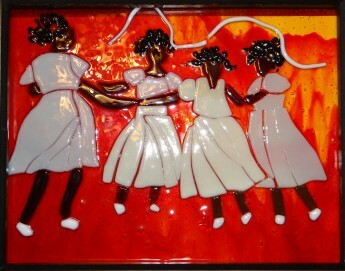 Loni has taught private mosaic and glass fusion classes to young children and adults. She loves seeing new artists gain a renewed sense of empowerment, freedom, and acceptance when they learn to work with this medium.